7. La Casita De Doña Machi, 1/18. I saw this on the drive from work to my son’s basketball game, and stopped in. I loved the atmosphere right away–the TV was tuned to a Spanish language news station. I had a burrito, which was so different from the fast food I’m used to–not nearly as mushy and juicy. Though that made it seem a bit dry to me, it was tasty, and washed down well with some hot sauce and soda. Very nice place–would definitely go again. 8. New China Cuisine, 1/26. One of a few Asian places near my house that I’ve never gone to. It doesn’t look like much from outside, near the edge of a middlebrow strip mall, but on the inside the atmosphere wraps you up and draws you in. I took my wife there on a date night–she likes Chinese food even more than I do. The waitress had solid suggestions for us–I tried some excellent sweet and sour shrimp. The appetizer was egg drop soup, which I love and haven’t had for years. It made me find some recipes online and try to make it at home–alas, not nearly as good as theirs. 9. Tacos El Gordo, 2/1. This came recommended from an old colleague, and I’m seriously grateful. The counter setup inside is a bit odd, but the food is sweet and solid. It’s like an In-N-Out Burger for genuine Tijuana tacos. Almost as good as the tacos was a creamy orange soda called Bang! Totally have to go back again soon. One of my goals for the year I’m 40 is to eat at 40 new places. I’ve done six so far, and the last four have all been Mexican places, because I love me some Mexican food. I pass this truck on the commute to work all the time, but never stopped by until recently. I grabbed a couple of cheap tacos–two for under five bucks–and loved them! Service was fast and friendly, place was clean, and the tacos were excellent! They even have a full condiment bar on the side. Highly recommended! I went to the one on Aliante and 215–great place! I tried a fish taco here for the first time, and was surprised at how much I liked it. Plenty more of these in my future. Highly recommended! A few weeks ago, we had one of those generic gift certificates that apply to lots of places, so we picked a new place at random to try. The little Divine Eatery cafe in Northwest Las Vegas is, just as its name suggests, a miracle. Run by Chef Esther, this hole in the wall of a strip mall in a residential neighborhood makes the absolute freshest food we’ve ever eaten. When my wife and I had our first bite of the appetizers, we went wide-eyed and shared a look that said, this is something special. Esther has worked at some big Strip hotels, and was offered an executive position, but decided to try for fame and fortune with her own place. The menu is very flexible–request to modify what’s on the folded sheet of paper they give you, and Esther will impress you. Prices are very reasonable–and you definitely get your money’s worth. Esther runs the place almost single-handedly. She’s trying to train others to cook her way, but it isn’t easy. She’s unique. We had garlic fries and potato wedges at first, then a pulled pork sandwich and adobo chicken, finished with some deep fried stuff for dessert. All highly recommended. They’re almost at the point where they need to take reservations. By the time you read this, they might be there. They’ve only been in business for about five months. I don’t drink much soda in the summer, and every time I get over being used to it, I notice a big change in my taste buds: vegetables taste better. I think sugar must dull the sensitivity of our tongues, and I just looked up some medical info that confirms it. What a world of variety we close ourselves off to when we bludgeon our palate with manufactured sweetness! I write this in the hopes that it will help me stay off sugar, and keep enjoying the juices of nature, like the tomato from my garden that I had this morning, which after two months without overindulgence in sugar, tasted better than most candy ever could. 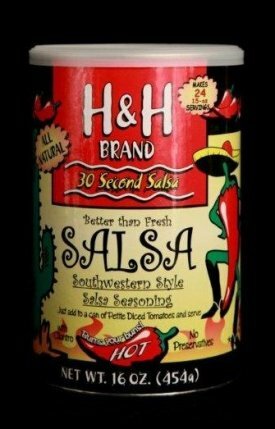 Last year at the annual Harvest Festival, I tried some of this salsa and loved it. I told my wife I wanted to buy a can. She told me that I had said the same thing the year before, bought one, and forgotten about it. It was still on a shelf in the pantry. Sure enough, she was right. I finally opened the can. I made some salsa to give away to others. I made some salsa for myself. Even better was using the dry mix as a topping on other foods. I can testify that this salsa mix is excellent on pizza, baked potatoes, chili, and on some sandwiches. It’s not so good on dry vegetables or tuna. That seems obvious now, but you never know. You definitely get your money’s worth and the salsa is fresh and full of deep flavor. Highly recommended! Last week I found, courtesy of Facebook, a new-ish blog run by a friend from church. She’s chronicling her family’s efforts to maintain healthy eating habits, but this little blog is already much more than that. Each entry gives easy recipes, yes, but the site itself also houses advice on where to find affordable whole foods (even giving specific product brands), and other suggestions for eating this way. Plus, the stories and pictures of her family learning to eat better makes for terrific reading. It’s fun, engaging, inspiring, and highly recommended. I admit I haven’t tried any of the recipes yet, but I will soon. After reading Born to Run a couple of months ago, I’m excited to add chia seeds to my diet, and I see them mentioned on Feeling Good Through Food. Also, I have something of a hobby of making up improvised, healthy smoothies–throwing whatever looks tantalizing into our blender. For this, also, this blog appears to have things to say to me. Looking forward to seeing a lot more of it!